Boracay White Beach is without question one of the biggest tourist attractions in the Philippines. As the tourists who have been there will say, there are no words to express its beauty. It has to be seen and experienced. Visitors to the island get to the beach via the boats that are on the three stations. There are also trikes that can transport you there. The beach faces west and is opposite the location of Bulabog Beach. The white sands of the beach stretches for 4 km. The whiteness of the sands and blue water combine to make it a visual spectacle. For many, the joy comes from simply strolling on the sands and soaking in the scenery. It is the perfect place to sit back and enjoy a drink. The scenery is even more beautiful during the sunsets. 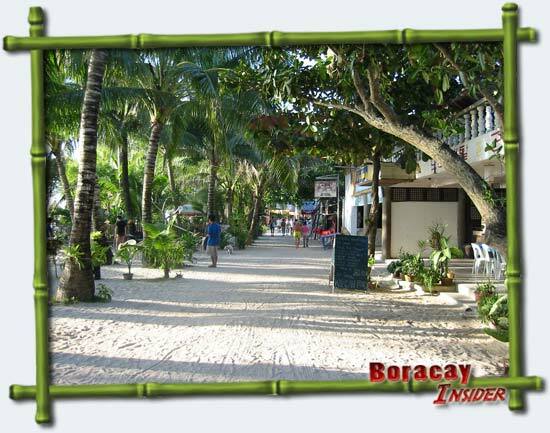 The place is also filled with friendly people, enhancing the atmosphere at Boracay White Beach. The white sands of the beach is the work of nature, produced by natural processes that lasted thousands if not millions of years. One of the reasons why the beach is such in pristine condition is that the island was for so long undisturbed. The island became the destination of choice for backpackers during the 1980s. Even today, the local government has very strict regulations for keeping the place clean. In the middle area is the 2 km Beachfront Path. This acts as the barrier separating the commercial edifices from the beach. Today you can get hotel rooms for 2000 pesos. During peak season (from April to May), the rates will be higher. If you plan to do some trekking, kayaking, diving etc, you have to spend at least 6,000 pesos. It all depends on how many people are going with you and the amenities you are looking for. The beach is also famous for its nightlife, so you can party the night away. There are also many restaurants around. Those looking to buy souvenirs do not have to go far either. Lodging places ranging from the budget type to the luxurious are all around. In other words, there is bound to be a place to fit your budget. Boracay White Beach is filled with people during the summer months, but it remains clean. In spite of the influx of people, the beauty of the white sands, the water and environment have remained unchanged. Previous Post:SPR Real Estate Inc.